New Folder: Choose an account, or a folder within an account, and then click this button to add a new folder or subfolder. Conversations: Click to change the arrangement of messages in the message list to Conversations or toggle to the date received arrangement. Arrange By: Displays a pop-up menu allowing you to choose options for displaying your message subjects. Reading Pane: Choose Right, Below, or Hidden. All Read: Marks all messages in your message list or folder as Read. Rules: Displays a pop-up menu from which you can apply or edit Rules. Delete All: Deletes all messages in your message list. 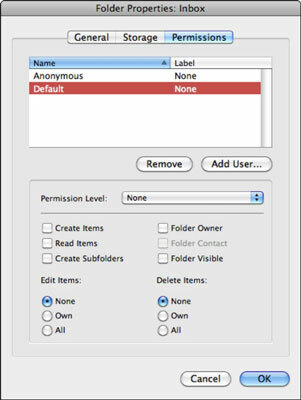 Permissions: For an Exchange account, displays the Folder Properties dialog on the Permissions tab. This dialog allows you to share your folders in your Exchange account. Click Add User to search for other Exchange users to share with, and add those users to the list of approved users in the dialog. To remove a user from the approved users list, select the user’s name in the user list and then click the Remove button. Properties: For an Exchange account, displays the Folder Properties dialog on the General tab, where there’s an option to empty the cache. Read the warning in the dialog before using this feature. Sync: Clicking this button causes the selected folder to be synchronized with the IMAP or Exchange server.